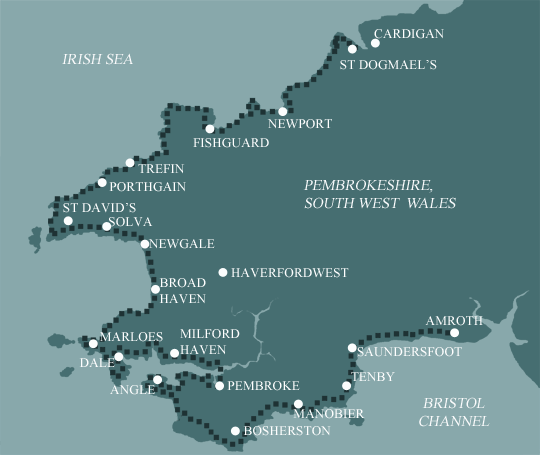 This is the shortest of our full length Pembrokeshire Coast Path holidays, walking the whole route in 13 days. This is the one for the serious (and seriously fit) walker! Average distances are high with the longest day being 20 miles. The hardest day is probably the last as it takes in the highest point of the entire route and there is nowhere to gain refreshment to spur you on, it is however probably the most rewarding with its spectacular rock formations. Amroth to Angle Beaches, villages, coves, cliffs and gun fire! The beautiful beaches and tourist attractions around Tenby make this the busiest section of the whole route with superb views of Caldey Island, and the coasts of The Gower and Exmoor. This section really typifies why this coast is worthy of National Park status. It contains Barafundle beach which was recently voted one of the top ten beaches in the world! It also fringes the famous Lily Ponds at Bosherston which are a National Nature reserve. The path is quite undulating, but you’re never far from a beach or village pub. Also included is possibly the flattest section of the trail much of which is restricted because of military use. Despite being a firing range, this ranks as one of Britain’s most important wildlife sanctuaries and is protected by some of Europe’s strongest designations. This final part of this section is very rugged and once away from Angle village it is deliberately managed to retain a ‘remote and challenging ‘ experience. The entire stretch is coastal – no roads, no houses, few stiles and no amenities at all. Due to its shelter from coastal winds this stretch includes many sections of woodland. Care must be taken to check the tidetables in two locations to avoid long detours on roads. Unfortunately a large part of this section is not within the National Park due to the proximity of industry associated with the haven. It is however still a very interesting walk rich in history, environmental and agricultural interest. The historic town of Pembroke and its castle are well worth a visit. This section takes you around the Dale Peninsula which is a walk of contrasts starting in the gentle, pastoral and, in places, wooded shelter of the Milford Haven waterway and ending on the wild and treeless Atlantic coast with spectacular views of the rugged offshore islands of Skomer, Skokholm and Grassholm. The path then continues to change again as you reach strikingly red low cliffs and coastal slopes and cliff tops rich in wild flowers. In places the red of the Old Red Sandstone is brightly streaked with yellow algae. The pretty village of Solva is well worth a visit due to its situation on an old glacial water melt channel. A must on this section is to visit the smallest city in Britain – St David’s and it’s beautiful cathedral. Make time to linger on the wild and rocky peninsular of St David’s Head which abounds with archaeology and has views across to Ramsey Island. Keep an eye out too for seals in the rocky coves below the path and gannets diving for fish out to sea; you may be lucky enough to see the grey dorsal fins of porpoises hunting for fish beneath the gannets. The section between Whitesands and Abereiddi feels wild and remote with hardly a building to be seen making the cafe at Whitesands or the refreshment van at Abereiddi a welcome sight for the weary walker! This is an exhilarating and in places rugged section of path above high cliffs and beneath the dramatic craggy volcanic outcrops of Pen Beri, Carn Lleithyr and Carn Llidi. There are plenty of dramatic sheer cliffs on this section where coastal erosion is an obvious process. Every year Pembrokeshire is a little smaller than the year before and the route of the Coast Path has to be continually reviewed to ensure safety. Mostly 30 to 70m high, the cliffs are of volcanic origin – gently rounded cliffs where the rock is strong and hard, sheer where there are weak strata. There are infrequent steep hills with rocky outcrops and loose volcanic stone where heather and gorse abound in a dramatic blaze of colour in August. The cliffs on the section from Fishguard to Newport are lower, mostly at around 40m. Although Pen Dinas rises to 142m, the level valley path (also National Trail) avoids this. Hills up from and down to the little beaches are steep but well spread out. Newport Town to St Dogmaels is the most challenging section of the Coast Path, 15.5 miles long with frequent very steep hills. There are no services between Newport Sands and Poppit. Walkers should ensure that they are properly prepared with adequate food, drink and clothing along this remote section. This is not a technically difficult walk and should be easy to tackle for most reasonably fit people. The paths are good, and there are no major route finding challenges. How Much Up & Down? More than you'd think! Although you never reach more than 200m above sea level (and most of the time not more than 100m) there are many short steep sections. On completion you will have ascended more than the height of Everest! Most days involve ascents of 200-500m metres, although no section is very steep for very long. By Air: The nearest airports are Cardiff and Bristol – International airports are London, Birmingham and Manchester. You can then travel by public transport to Amroth. By train from London (5-6 hours) via Swansea to Kilgetty (request stop) or from Bristol and Cardiff (2-3 hours). Then bus to Amroth (3 miles). By coach National Express from London or Birmingham to Haverfordwest via Tenby. By Road: M4 to Swansea, A48 to Carmarthen, A40 to St Clears, A477 to Kilgetty then a short drive to Amroth. By Public Transport: Bus (Provider: Richards Bros 407) to Cardigan then bus (Provider: Morris Travel 460) to Carmarthen for main rail links. By Road: B4546 to Cardigan, A48 Swansea, M4 for all directions southeast. Pembroke is the birthplace of Henry VII and is steeped in history. The 900 year old castle is the focal point of the town, standing guard over the river and well worth a visit. The town itself was fortified and walled, and sections of these walls are still visible. Visitors can take the popular town trail and there is also a daily indoor market and numerous small craft, gift and specialist shops. Standing on an imposing headland commanding superb views of the bay, Fishguard is the main shopping centre of north Pembrokeshire with two small supermarkets and family-run shops and businesses. The area is famous as the location of 'The Last Invasion of Britain' when in 1797 French troops landed nearby. Local heroine Jemima Nicholas captured many of the invaders single handed and the Frenchmen later negotiated their surrender at the Royal Oak inn and laid down their arms on Goodwick Sands.